Welcome and hello everyone! 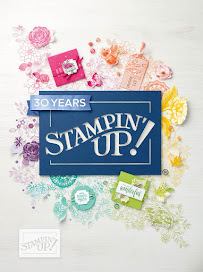 Today I have a special post for you...an Aim for Alaska Blog Hop Sneak Peak from the new Stampin' Up! 2017 Holiday Catalog! That's right. You will get to see a whole bunch of blog posts from varies members of the Aim for Alaska group with new product from the new catalog! 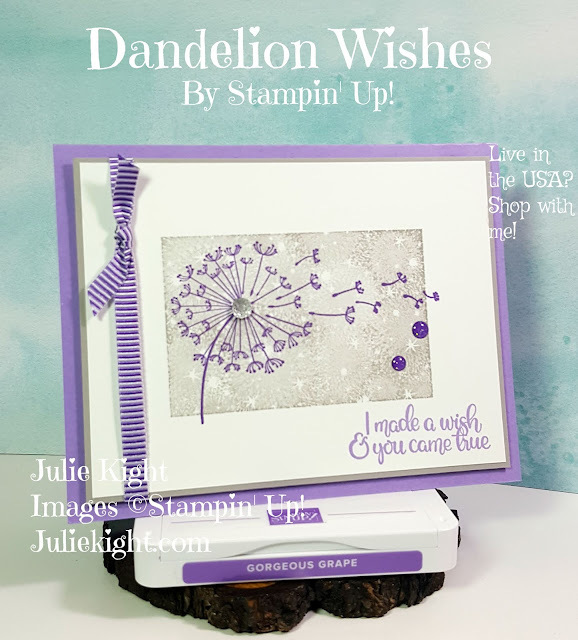 Now, I am sure if you have been strolling Pinterest by now you have seen a few of the new stamp sets, punches, dies, and DSP (Designer Series Paper). Aren't they pretty? Especially the new Painted Harvest Bundle! That has been a huge hit in the demonstrator world. 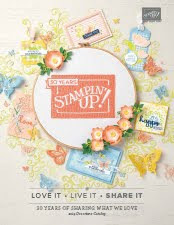 But today I decided to use one of the other stamp sets that I just fell in love with...the Merry Cafe stamp. And the best part is it coordinates with the Coffee Cups Framelits! So no fussy cutting! There is a little something for every holiday season on this stamp set too, but I especially loved the Pumpkin Spice Latte stamp. It is a cult following for this specialty drink. I have had it only once, but I fell in love with it too! 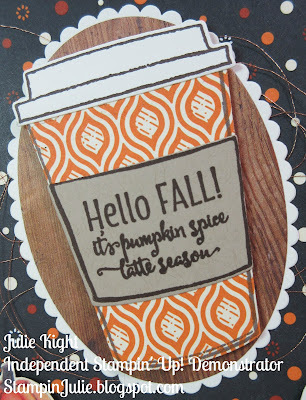 I started my card with using the Merry Cafe stamps and stamping all the parts to the cup on various pieces of cardstock and DSP. Next, I die cut out the cup pieces and put it together. I also die cut out the ovals the cup sits on using the Wood Textures DSP and Very Vanilla cardstock using the Layering Ovals Framelits. I put Dimensionals on the cup and popped it onto the oval frame and set this aside for now. 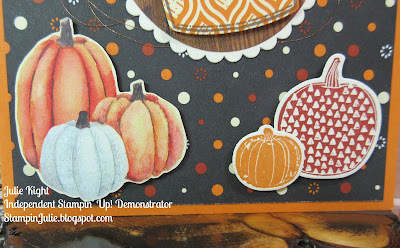 Next, I fussy cut out the pumpkins on the left out of the Painted Autumn DSP. 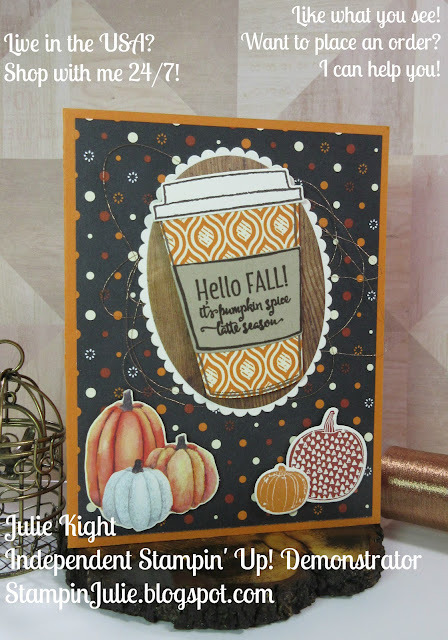 I also stamped the pumpkins on the right using the Pick a Pumpkin stamp set and used the Pattern Pumpkin Thinlits to die cut them out. I next made my card base using a piece of Pumpkin Pie cardstock cut to 5-1/2"x 8-1/2" and folded in half. I cut a piece of the Spooky Night DSP to 4"x 5-1/4" and glued it onto my card base. I took my Fast Fuse and placed some on the back of the cup piece. I then took some Copper Metallic Thread and wound it around my hand a few times. I placed this thread onto the back of the cup piece using the Fast Fuse to hold it down in place. I glued this whole piece onto my card base. I then popped up the pumpkin pieces using Dimensionals as well and placed them on the bottom half of my card. Now, I don't like seeing a "naked" card on the inside so I used the coffee beans stamp from the Coffee Cafe set and stamped some onto a 4"x 5-1/4" piece of Very Vanilla in Early Espresso (very fitting color name!) and glued this piece down inside the card. And there you have it! A very cute Pumpkin Spice Latte card for an avid Pumpkin Spice Latte friend or family member. And for a birthday or just a thank you gift, put maybe a Starbucks gift card inside for them to get their Pumpkin Spice Latte coffee. Perfect! 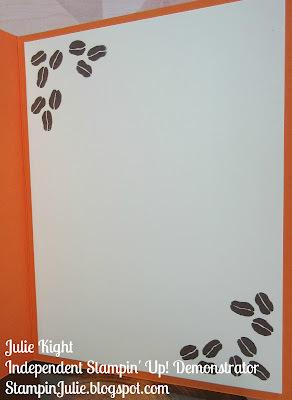 Here is the list of all the individuals participating in our Sneak Peak Blog Hop today. If at anytime you get lost then just take a look at the list to find out where you are at. Thanks so much for coming along on our Blog Hop today, and I really hope that you have enjoyed all the projects that you have seen. Are your wish lists getting big yet?! Remember you can start ordering on September 1st. And if you need to place an order then just go here to my store 24/7. This is such a nice card....am falling in love with those pumpkins more and more each day. Nice card, Julie. I like all of the products you have brought together into one project. Well done!